The annual budget of Rhode Island PBS is $3 million. 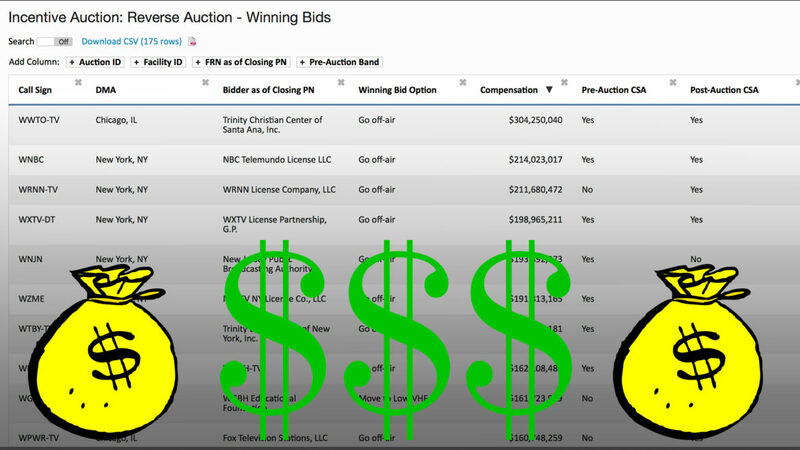 It just won $94.5 million in the FCC’s spectrum auction, in which TV stations sold channels to wireless providers. To put that in more human terms, that would be like if you made $50,000 per year and someone came along and gave you $1.6 million. It might not be enough to keep you in luxury forever, but it’s definitely enough to solve every immediate problem in your life and then some. And, actually, it could keep you in luxury forever if you plan properly. The $1.9 billion that noncommercial stations won in the auction isn’t enough to transform the entire public media system, but it will absolutely transform the handful of stations lucky enough to have held valuable spectrum in crowded markets. Rhode Island PBS President David Piccerelli tells me on The Pub this week that he’s going to replace the station’s leaky roof and make some other upgrades, and then put the bulk of the money into an endowment. He’s lucky in that Rhode Island PBS is licensed to a community board that won’t be tempted to spend the money on anything other than the station and its services. In contrast, other big winners are licensed to state governments and colleges and universities that might be quite tempted to spend their winnings on things that have nothing to do with public media or its mission. On this episode, we’ll talk about where the money is going and where it should be going with Piccerelli, Current’s Dru Sefton and Oregon Public Broadcasting CEO Steve Bass, who has a strong message for stations that, unlike his, have just received an unprecedented windfall. “Just go and do something big and bold, rather than looking at this and saying, ‘You know, now we just don’t have to worry and we can keep going the way we have gone in the past,’” Bass said. I think the representatives of the Public stations who have taken money in exchange to go to the VHF-lo band are being less than honest when they claim that it will only have a marginal effect on their terrestrial coverage. For example WGBH Channel 2 in Boston currently operates with about 700,000 watts, at their new frequency they will be operating with a mere 5000 watts (less than 1% of their current power). While I can currently receive both WGBH Channel 2 and WGBY Channel 57 (out of Springfield) where I live a couple towns West of Worcester, MA I likely will receive neither once the repacking is completed. WGBY is also owned by WGBH and have agreed to sell off WGBY’s spectrum (WGBY currently operates with about 400,000 watts and will be going down to about 1000 watts. You can see this for yourself by checking out the FCC spreadsheet of the new channel assignment and power by going here and clicking on the link for “Post Auction Technical Parameters” . http://data.fcc.gov/download/incentive-auctions/Transition_Files/ In short public TV in general seems to be giving up on over the air broadcasting as at these powers the stations are basically “nightlights” with a mere fraction of their current Over The Air coverage. Basically it will now be mandatory to be a cable tv customer to view their programming. VHF in general offers a poor signal for DTV and will not provide the public service that UHF does.